Double-click a task calendar name in the Calendar List. 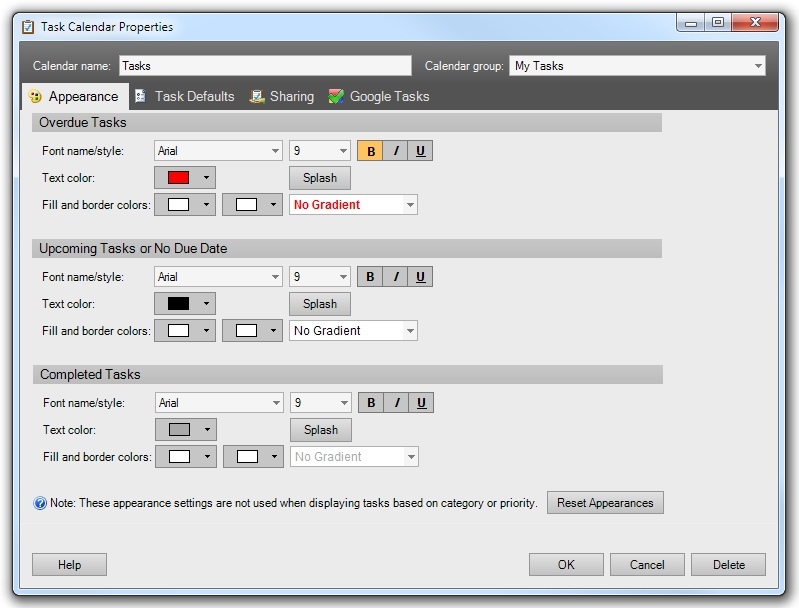 Right-click a task calendar in the Calendar List and select the Calendar Properties command. With a task calendar selected, click the Task Calendar Properties command in the Edit menu, or press the F2 keyboard shortcut. The Properties of the currently active task calendar will be shown. Each task calendar of the Calendar List can have its properties individually modified. These properties consist of appearance settings for overdue, upcoming, and completed tasks. The properties also consist of default settings and reminders for new tasks. To view or modify a task calendar's properties, you can double-click the task calendar in the Calendar List or use the Calendar Properties command from the Edit menu. The keyboard shortcut is F2. When you're done making changes, click the OK button to save. Or, if you'd like to discard the changes, click Cancel. You can delete the calendar and all its associated tasks by clicking the Delete button. You'll be prompted to confirm. The task calendar can be synced with Google Tasks or shared over a local network (Ultimate version only). The calendar can be renamed. This name will appear in the Calendar List. A group can be specified for the calendar. Calendar groups are used in the Calendar List to group similar calendars. The assigned group can be modified by dragging and dropping the calendar in the Calendar List, or by specifying a group name in the Calendar Properties window. To select an existing group, use the drop-down button. To create a new group, type in the desired name. The appearance of overdue, upcoming, and completed tasks can be modified as described here. Note, these color settings are not used when the "Color Events Using..." option on the View menu is configured to color items based on associated category or priority. 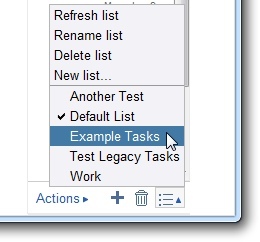 Default settings can be specified for new tasks belonging to the specified task calendar. Category - This is the default category to be associated with new tasks belonging to this calendar. For example, if the calendar is intended to be used for birthdays, you could set the default category to "Birthday". Categories can be selected by clicking the drop-down button, or new categories defined using the "..." button. One or more categories can be selected. If you don't want a default category, uncheck all the boxes in the drop-down list. Priority - This is the default priority to be assigned to new tasks belonging to this calendar. The priority can be selected from the drop-down list, or a new priority defined by clicking the "..." button. Has due date - When checked, a new task will default its due date to the date that is currently selected in the calendar view. Float to current date when overdue - When checked, new tasks will default to be "floating". This means the task will float along with the current date until marked completed. This can be useful if a task needs to be completed but doesn't have a specific due date, and you want to see the task in the calendar instead of having it only appear in the Task List, as is the case for non-floating tasks that have no associated due date. Has start time/duration - When checked, a new task will have a start time and specified duration. The default start time can be selected from a drop-down list or set to "Auto". If Auto is selected, the start time will be based on the current time if the task is being created on today's date. Otherwise it will default to the work day starting time as specified in the Calendar Options. The default duration can be selected from the a drop-down list to the right of the start time field. Repeats Every - When checked, a new task will default to repeating at the specified default interval. When a repeating task is marked completed, the next instance is calculated based on the specified repetition interval and whether the task repeats based on completion date or original due date. When using the Ultimate version, task calendars can be shared over a local network, enabling the same tasks to be viewed or modified by multiple people or from multiple computers. Task calendars are shared through VueMinder Server. Installation instructions can be found here. To share a task calendar over the local network, check the "Share this calendar" box. If this is the first time you've shared a calendar, you may be asked to specify the server name. All computers sharing calendar data must be configured to use the same server. The server can be specified in the Sharing Options window. After sharing a task calendar, it can be added to the Calendar List on other computers by using the Add Shared Calendar From Local Network command, accessed from the File menu. When the "Share this calendar" box is initially checked, the calendar will default to being read-only for all people on the network. You can assign a different default permission for the "(Everyone)" identifier, or you can selectively assign user permissions to override the default. In the example above, two additional users were added with "Contributor" permission, meaning they can both view and modify the calendar. Another user was set to "No Access", meaning they cannot view the task calendar. All other users can only view it. Permission levels are stored securely in the shared database, using 256-bit encryption. This ensures the data is secure from unauthorized users. Contributor - The user can add, remove, or modify notes belonging to the calendar. Note colors can be changed and shared with other users. The user can also change the calendar's defaults for new notes. Reader - The user can view notes. The user can also change note colors, but changes are only on the local computer. Any other changes, such as modifying or deleting a note, will not be allowed. No Access - The user will not have any access to the calendar. If this is set as the default permission level, nobody else will be able to access the calendar unless overrides are added. If you login to multiple computers, you'll be able to access the shared calendar, but other users will not see it. If you have a task calendar in VueMinder that you would like to add to Google Calendar, open the Task Calendar properties and then click the "Google Tasks" tab. Next, check the box labeled "Synchronize with Google Calendar". Note: When syncing is initially enabled, a web page will appear asking you to log in and/or provide permission for VueMinder to access your Google Calendar data. Make sure to click the "Allow" button. If you do not, the calendar won't be able to sync. After clicking OK, the calendar will be added as a new "task list" in Google Calendar. Unfortunately, Google Calendar is limited to showing one task list at a time. You can pick a different task list from the "Switch List" button in the lower-right corner of the Google Calendar web page. A frequency can be specified for automatic syncing. Available frequencies are "Every hour" and "Every day". If automatic syncing is not desired, select "Manually". Syncing can be manually commanded using the Sync Calendar command on the Share menu or Status Bar. 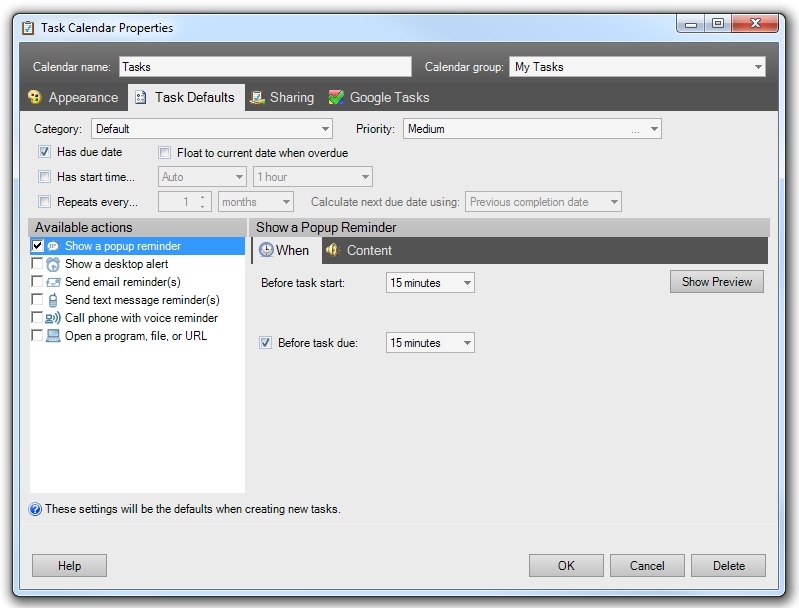 When this box is checked, the default task settings specified on the Task Defaults tab will be applied to new tasks that are adding to VueMinder as a result of syncing with Google Calendar. In other words, if you add tasks to Google Calendar, you can use this option to automatically configure those tasks to show reminders in VueMinder.